Home / Event / What’s Under That Dress? Join us for light refreshments and an afternoon of fun as Yvonne Sullivan and the Living History Ladies demonstrate “what is under that dress”. They will be dressing from the corset out, including what a lady wore during the day, depending on what activity she was attending. Yvonne has been sewing costumes for over 30 years. 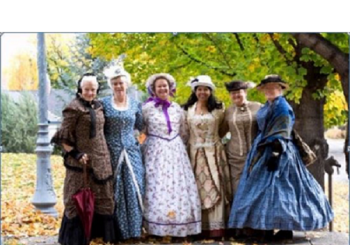 She and her friends enjoy getting together often to sew their historical dresses from the 1860’s, 1870’s and 1880’s. Early bird tickets, purchased before Friday, June 16, 2017, at 4:00 p.m. are $20.00 each or $15.00 for museum members. After Friday, June 16 and at the door tickets are $25.00 each or $20.00 for museum members. The Historic Fourth Ward School Museum is a non-profit 501c(3) foundation. Your ticket purchase helps support the Last-One-Standing.